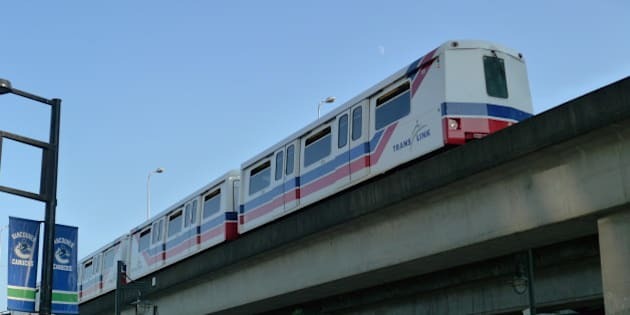 Metro Vancouver&apos;s Transit Police are looking for a suspect who allegedly groped a teenage girl as she walked up the stairs of the New Westminster SkyTrain Station last week. The 16-year-old girl was walking up the stairs last Wednesday when two men passed her walking down, according to police spokeswoman Anne Drennan. "One of the men spoke to the girl and then sexually fondled her, with the two men then laughing and leaving the station. The second man did not participate in the assault," said Drennan. "CCTV footage shows the men entering the liquor store adjacent to the station following the assault. It also indicates the men originally boarding a train at Stadium SkyTrain Station at approximately 8:25 p.m."
- A white male, about 25 years old. - 5&apos;8" to 5&apos;9" tall and 170 to 180 lbs. - Very short light brown hair with a receding hair line, and clean shaven. - Speaking with a Russian accent. - Wearing a dark blue hooded sweatshirt with Hollister California printed on the front. - Wearing light-coloured jeans and black skater-style shoes. Anyone with any information is asked to call Transit Police at 604-515-8300 or Crime Stoppers, if they wish to remain anonymous.